Traditional Style QSL Cards $9.99 Per 100 Everyday! 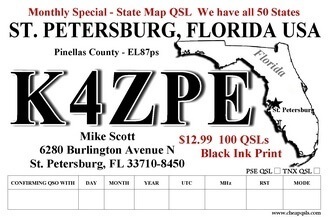 The Lowest priced QSLs in the USA at $9.99 for 100 economy black ink cards. QSLs that will fulfill your need to confirm that contact without breaking the bank. Deluxe black ink cards for those wanting more on their QSL cards. QSLs priced at only $14.99 for 100 QSLs. These QSL cards have designs for every operator. Deluxe Color cards with back report. Optional White Glossy stock. Choice of callsign and cardstock colors. At $28.95 per 100 cards. Our top of the line QSLs. With 140 different QSL designs, we have a QSL card to please you and within your QSL price budget. We have the USA's lowest priced QSL cards! Secure online shopping. Fastest turn around in the business. Your invited to browse the large selection in our QSL catalog. We have qsl cards for DXers, Club and Net themed cards and the very popular QSLtoon© QSL. We also have QSLs for the SWL. New preprinted blank QSLs for $4.50 per 100 Cards. We have the lowest priced QSLs in the USA ! A QSL Super Store ! We price our QSL cards to give you options on selecting just the right card your looking for without paying for what you do not want. We strive to provide good quality QSLs at modest prices. A QSL for every type operator. Even our economy $9.99 QSLs will get that DXCC or WAS award on your shack wall. Give us a call or email us with any questions you might have. From start to finish we do all our own work unlike other companies. Email Proofs before printing. Fast turn around time. All our QSL processing is done by us in our own shop. This is why we have fast turn around times. Since we began printing QSL cards we have been emailing a proof of your card for you to review before printing. Other printers soon followed this practice. It saves your QSL cards showing up in your mail box with an error. Our QSL Card Service is second to none. We strive to provide a positive experience when buying your QSLs. Our quick turn around on shipping our QSLs continually brings compliments from our customers. Reordering is easy with our "Reorder" page. If we make a mistake on your QSLs, we will make it right, no questions ask or cost to you. Our customers say it for us.